Personally prone to loquacity, I do however try to keep my blogs to a readable length, vigorously enforced by my in-house editor, Gabrielle. So, happily blogging away about sheepy things, muttony things and Price Charles’ penchant for shapely chests in uniform (Jan 19th blog), I ran out of space. 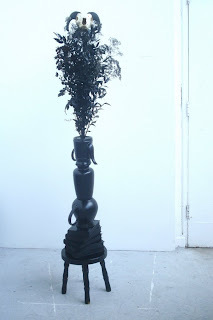 I’m motivated to return to these topics (HRH Charles excepted) by wonderful cooking smells filling the room. 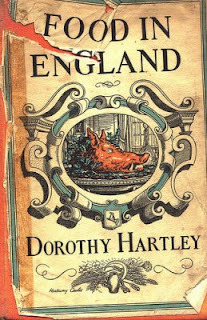 I hoped for (and coincidentally received) Dorothy Hartley’s Food in England for Christmas. It’s an English cooks’ bible, first published in 1954, that we thought would bring some Anglo-Saxon balance to our cookbook collection, which is otherwise full of instructions and advice from as far apart as India, Italy and, of course, France. There’s some patriotism at play here as we have, on more than one occasion, been complimented by French dinner guests on how good our food is, whilst strongly inferring “in spite of being English”. Tonight, we will sit down to a plate of boiled mutton with caper sauce accompanied with boiled potatoes, carrots and leeks. Never mind a curry, spag bol or ’aute cuisine, this is just the thing for a winter’s supper in front of a blazing wood stove. It’s particularly appropriate fayre as we’ll sit down afterwards to the last episode of the BBC’s engrossing re-enactment of a year on a Victorian Farm. It's a fascinating epoch as it’s the beginning of mechanised farming. Yet many of the things the Victorians did would sit very happily under permaculture’s umbrella. I started off by telling you that I have a propensity to verbosity and that I was going to blog about sheep. So, proving the former and keeping to the latter, I’ll quickly tell you some sheepy stuff and then stop. 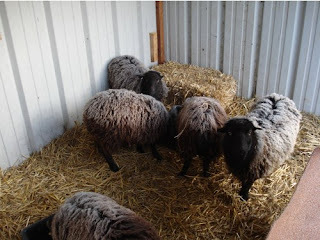 The photos show a new sheep shelter I’ve built in one of our fields (more substantial than the pallet-based ones I’ve built up to now). 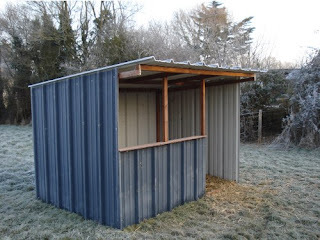 It’s made out of corrugated metal sheeting that was covering one side of the barn roof that I’m currently replacing and is large enough for me to stand up in. Our frost-covered sheep certainly seem to like it. It’ll be particularly useful if we get into any problems at lambing time. 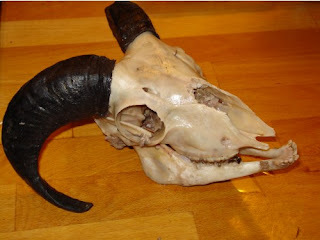 And, eager not to waste any part of the sheep, we’ve sent the skull of the male hogget ("lamb" over a year old) we recently slaughtered to a budding talented new English artist, Miss Christina Sanders (Gabrielle’s daughter) who’s incorporated it into a sculpture or should that be “skullpture”? She’s in her final year of university and more-than-ready to listen to offers of fame and fortune from Mr Charles Saatchi. Next blog baby booties and woolly chicks, both made by Gabrielle from felting our sheep’s wool. - but I can't guarantee it will work in France!